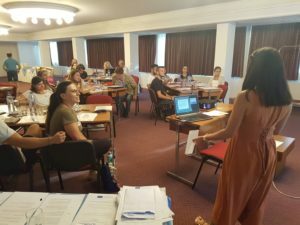 As part of the Decisions and Dilemmas 3: making learning about the EU motivating and meaningful project, the Cypriot national training event was held on the 28th and 29th of August, 2018 in Platres. The workshops of this national training were facilitated by the Educational Programs Officer of the Association for Historical Dialogue and Research (AHDR), Mr. Loizos Loukaidis, Educator and AHDR Associate Researcher Ms. Evie Grouta, and Joaquim Carvalho from the Association of History Educators of Portugal. Participants of the workshop came from diverse backgrounds, including from Greek-speaking and Turkish-speaking primary and secondary education, teachers from public and private schools across the divide in Cyprus as well as youth and NGO workers, graduates of different universities and retired historians and teachers. The first day of the event started with an introduction to the work of the Association for Historical Dialogue and Research (AHDR) by Loizos Loukaidis. Some participants were already familiar with the work of the AHDR, and thus they were invited to participate in the presentation and contribute to the discussion. This offered a sense of belonging and continuity that impressed new participants. The presentation also offered participants an insight into the vision, mission and different projects and activities of the AHDR. This acquaintance of participants with the organization is expected to act as a multiplier for future events and collaborations. Following this presentation, Ms. Grouta and Mr. Loukaidis engaged the participants in an introductory workshop on Historiana. In this context, the participants were reminded of basic historical concepts that would be useful for their work during the workshop. Then the tools themselves, Historiana and Europeana, were introduced through a presentation and demonstration. Participants were divided into mixed groups and discussed the execution of different tasks such as the creation of their own learning resources, which they subsequently presented in the plenary. Most participants expressed interest in exploring this new tool and were happy to know that there are also lesson plans provided in their mother tongue. They found the website useful and stated that they will make use of the lesson plans as much as possible. They were also informed that they have the opportunity to modify the level of resources as well as the duration and complexity according to age groups. On the second day of the event, Ms. Grouta and Mr. Loukaidis elaborated on the research results of ‘Teaching Europe to enhance EU cohesion’ and briefly provided the participants with background information on the overall project and the partners. They stressed the role of EUROCLIO as the umbrella organization bringing together different educational stakeholders around issues concerning the teaching and learning of History. 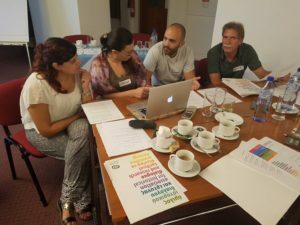 The workshop facilitators presented the research results, making the necessary connections with the Cypriot context across the divide and invited the participants to share their professional experience. The participants were extremely interested in finding out how such a diverse group of educators working in such different and complex conditions managed to collaborate to bring together the results from such a wide spectrum of educational backgrounds and produce educational material that would cater everybody’s educational needs. The facilitators made sure that participants realized the importance of addressing cross-cutting issues to teach about European History and the necessity to engage in educational activities that highlight the importance of identities and the complexity of interactions in contemporary Europe. During the discussion, participants identified both challenges and opportunities while engaging in the study of the European History, which is – up to a certain extent – neglected because of the focus on local histories and the histories of the so-called motherlands of Cyprus. This engagement with the History of Europe and the EU, according to their feedback, will help them to also understand the regional conditions and draw the connections with other contexts thus connecting the micro to the macro as a prerequisite of the educational process while studying history. Following the aforementioned presentations, Mr. Carvalho presented the work of his Association in Portugal and, then, himself and Ms. Grouta facilitated the activity “Trade in a Global Context – How does European Trade affect African Chicken farmers?” employing the relevant Historiana unit. The aim of the unit was for participants to understand how complex the question of the impact of the EU trade policy on Africa is and that answers are equally complex. The participants were grouped and worked on the activity sheets provided in order to identify consequences and effects. They discussed ‘Who benefits most from the current practice of exporting cheap chicken meat to Africa?’ and subsequently worked on comparing and contrasting ideas. In addition, participants discussed issues of social justice, post-colonialism, and compassion as well as fair trade practices and the role of citizens and states in this process. Most educators suggested that this lesson plan could also be used in the Geography and Citizenship class. Most importantly, participants engaged in a discussion on the methodological tools employed in this educational process and gave feedback on how they would approach this issue in their classrooms. Next, participants engaged in educational activities under the theme of ‘Opening Europe’s Borders for People and border controls in a (post)Schengen world – How did the migrant crisis shake the foundations and principles of the European Union?’. 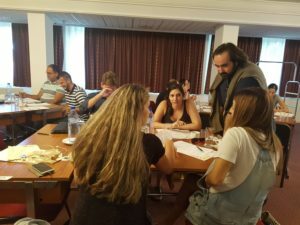 The aims of this activity, facilitated by Mr. Loukaidis, were for participants to identify and analyze the positions of various actors in the EU in relation to the migrant crisis, including people who are pro- and anti- ending Schengen freedom of movement, and the perspective of people living outside Schengen. Furthermore, participants had to assess in what ways and to what extent the migrant crisis has influenced relations within the EU and give their own reasoned argument as to how the EU should cope with the migrant crisis. At a first stage, Mr. Loukaidis presented the history of Schengen and assisted participants in learning to deal with questions that move students from the facts on to starting to form their own opinions. Then, before moving on to group work, he introduced the migrants’ crises with the animated maps so that participants would get acquainted with the main developments and routes of migration to Europe since 2004. Following this background information, the participants were divided into mixed groups (according to community background and gender) and provided with files of source material representing different opinions on the migration crisis and the future of Schengen. Students studied the source material carefully and completed the worksheet which was used in the following discussions. Representatives of all groups then presented arguments to address different questions using information from the perspectives they had studied. That is, they were taking the position of the viewpoint they had just studied. The facilitator stressed that this technique can help students feel more comfortable discussing emotional and controversial topics. To complete the activity, the participants had to think about what they would write in a paragraph answering the question ‘How did the migrant crisis shake the foundations and principles of the European Union?’. The activity ended with a discussion on how they would transfer the knowledge and skills acquainted through this activity in their educational contexts. It is worth mentioning that the suspension of the Schengen Agreement for Cyprus – due to its political issue – as well as the sensitivities and the restrictions to the freedom of movement from one side of Cyprus to the other were part of the discussions during the reflection phase of this activity. Overall, the participants were highly engaged and participated actively in all stages of the workshop. The participants welcomed the AHDR team as well as the international expert and all of them were engaging in discussions in mixed groups. They expressed their content about the knowledge and skills provided during the workshop and assured us that, with certain adaptations to their context, they can utilize the knowledge they have gained in their classrooms. They seemed very engaged in discussions about contemporary issues such as migration, fair trade, social responsibility, intercultural understanding etc., and stressed the role of history in suggesting alternatives and as functioning as a vehicle for educational and social change. This article is based on the report written by Mr. Loizos Loukaidis, Educational Programs Officer of the Association for Historical Dialogue and Research (AHDR).